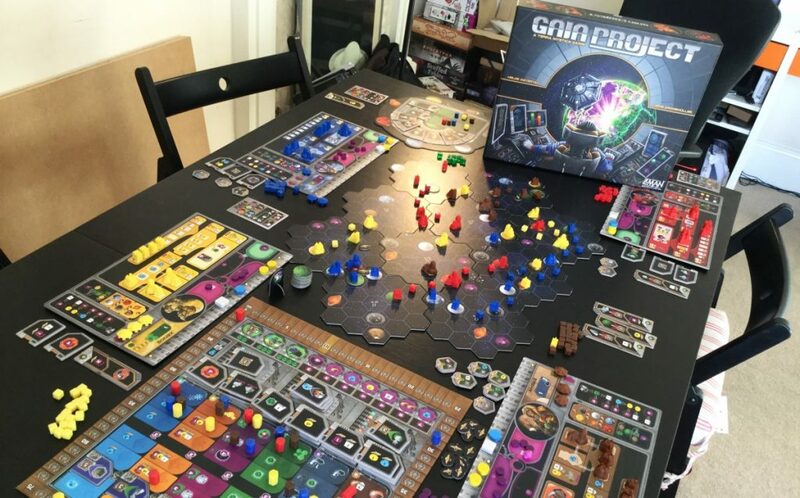 Quinns: So you walk into your local board game shop, eager to make a purchase. An unhealthy, bubbly excitement starts building inside you, as if you were a shaken can of cola. You scan the shelves, letting your obsession rise from the pit of your stomach to slightly above your stomach. You’re taking one of these boxes home. So you drop to all fours, ready to begin the hunt. The shop owner doesn’t give you a second glance. He’s seen it all before. You prowl between the aisles, buttocks undulating like a pair of bald men being ritually drowned. What’s this? Elysium… ? It’s a brand new release from Space Cowboys, the hot young publisher of the wonderful Splendour and the entirely passable Black Fleet. Elysium looks great! 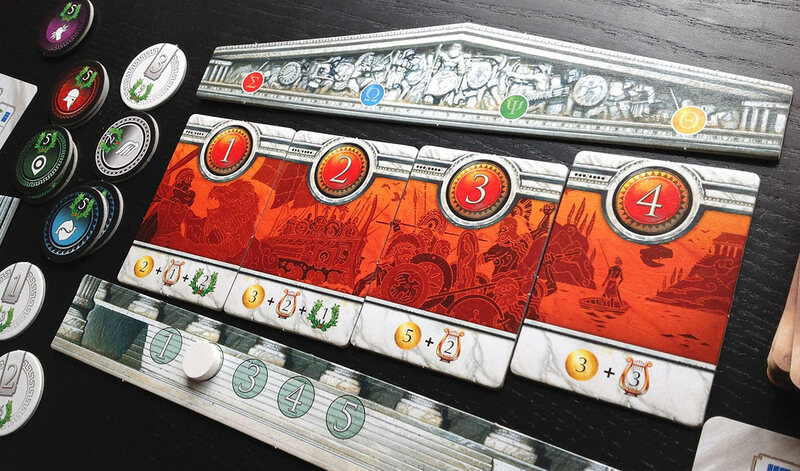 It’s got cards, Greeks, gods, it looks lovely and it’s different every time you play. “STOP!” comes the cry, as I slide down a nearby fireman’s pole (was it there before?!). 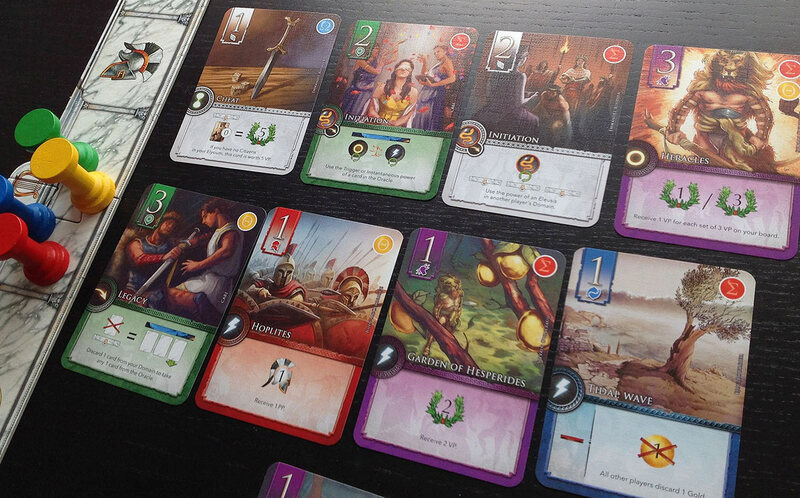 “Elysium’s a card drafting game with a lot of very fancy components. Think 7 Wonders, if you’ve played that. “Players all control demigods trying to secure seats on Mt. Olympus. 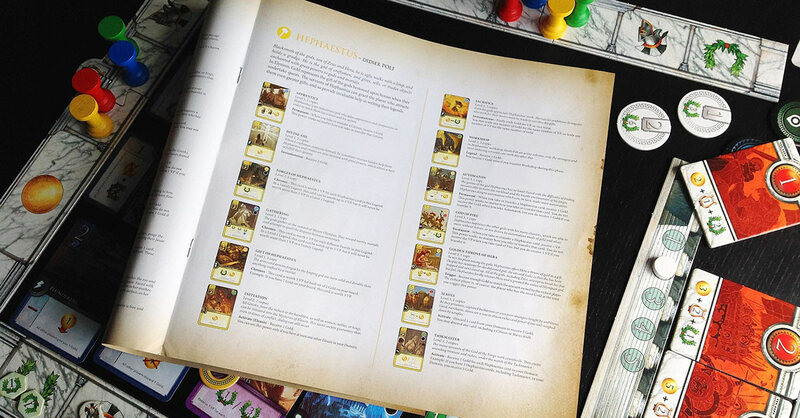 Each turn a load of mythological cards are dealt out in the centre of the table, each card offering some special bonus, and players first take turns claiming these cards, slowly building up godly tableauxs in front of themselves. “So one player takes the Temple of Ares, another takes Hera’s Steel Automaton, and so on. At some points players also need to claim one of the four cardboard Quest Cards at the top of the table, determining stuff like next turn’s player order and income. 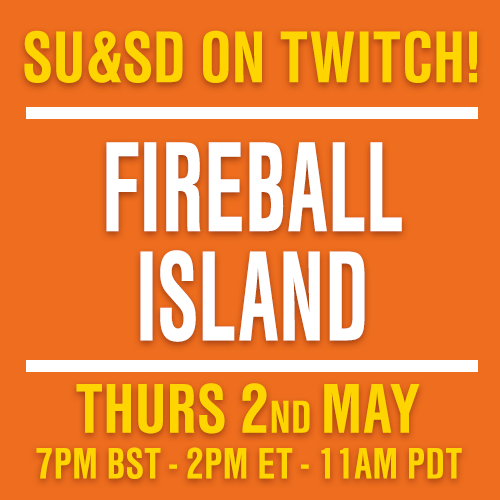 “What you’re trying to do here is build sets. Ultimately, you want sets beneath your board containing all three numbers of one colour (each colour representing a Greek god), or all five colours of one number. These sets are the main source of victory points that’ll win you the game. “First things first, though. 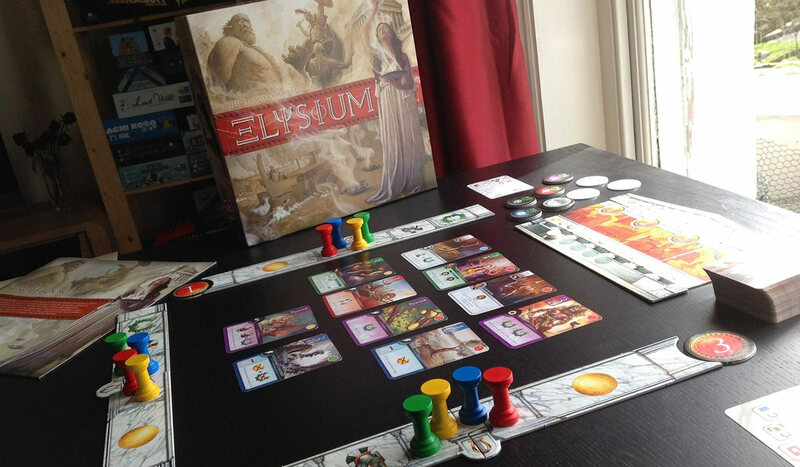 Elysium’s theme is kind of a Greek tragedy. The art on the cards is absolutely gorgeous, there’s endless amounts of it, there are all sorts of components to fiddle with and it all sockets into a perfect box inlay. There’s just one problem. The game you’re playing doesn’t fit. “You never once feel like you’re recruiting heroes or WRITING THE LEGENDS. You’re picking up cards using different colours of wooden pillars, fussing over numbers and counting victory points, your mind a million miles away from the beautiful paintings in front of you. “Instead, Elysium’s selling points are twofold. Firstly, it’s a tricky puzzle. You have to weigh up which cards you want, and decide when to forsake their power to add to your sets (as well as figuring out which sets to strive for). 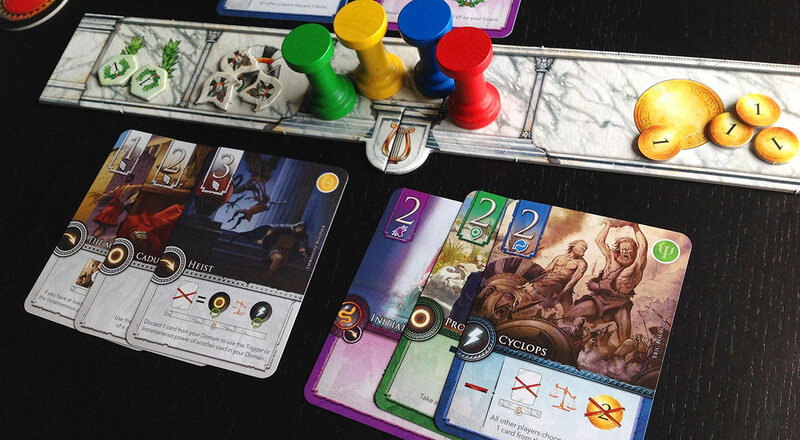 Secondlymost, you only ever play with five of the eight Godly sets of cards which come in the box, a lot like how you randomise the market in Dominion, so every game of Elysium can feel a little different. Especially so because every god’s cards is drawn by a different artist. What a lovely idea! This sounds alright, you think to yourself. Your eyes play over the box in your hands. You begin rubbing it vigorously, testing the durability of the cardboard. “There’s no other way to say this. Elysium just isn’t very fun. “Think about great games that don’t feature a great deal of interactivity with other players, and you’ll always find an overwhelmingly moreish gameplay loop at their centre. Whether you’re expanding a cosy home in Caverna, developing a beautiful kingdom in 7 Wonders, or setting up dramatic point-spitting combos in a Stefan Feld game. 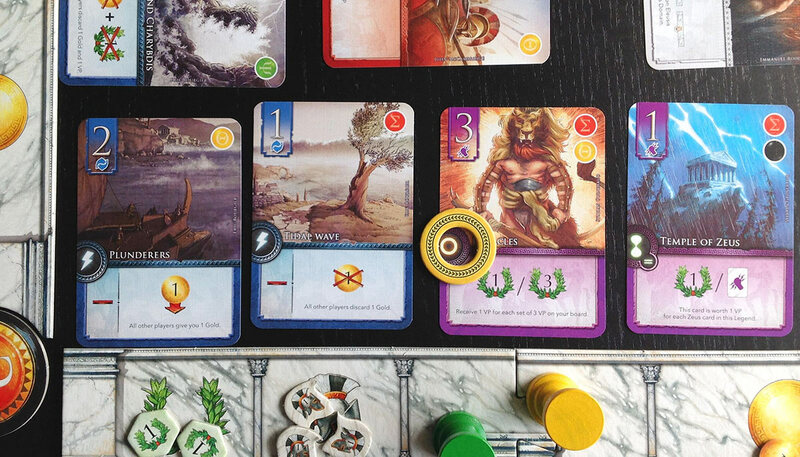 Elysium is no less rich a puzzle than any of these, and you’re forever scratching your head. But you’re not having much fun solving it. “A round starts with everybody leaning over into the middle of the table and squinting at a dozen new cards. The colourful, semiotic language on them might as well be Ancient Greek, so you have to read the teeny text beneath. If you had these cards in your hand that’d be easier and feel nice, but no, you have to lean right over the table like a plumber examining leaky pipes. Not just that- examining ten or thirteen new pipes every turn. There are so many cards in this game you’ve got this Sisyphean chore of learning new ones all the time. “Then you claim them. But the requirement for claiming them is an unexciting mechanic that doesn’t link up with anything else in the game- you can only take a card if you have the right coloured pillars, then you remove a pillar of your choice from your board for the rest of the turn, limiting your options. Not a terrible mechanic at all! But not a fun one. 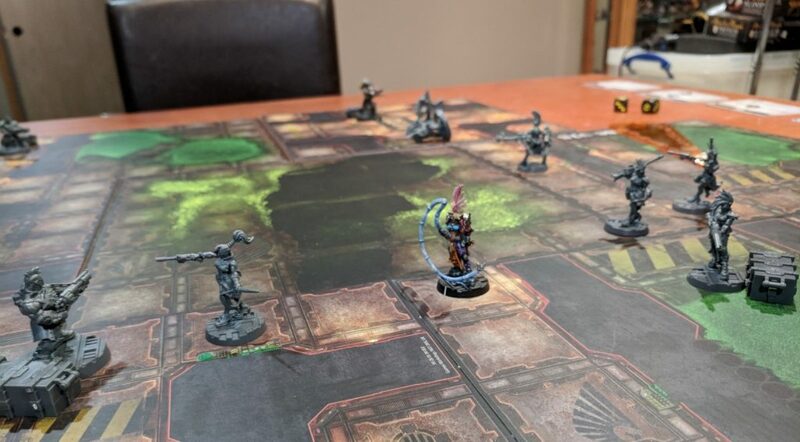 “Finally, just to ensure you rarely feel a sense of ownership over what you’re developing, we enter a phase where you plough these cards into the nether beneath your player board, stripping yourself of their benefit. This is a tough decision but again, it’s not an entertaining one, because you’re sacrificing a power for a VP bonus that only arrives at game end, when everybody gets the calculators out on their phones to tot up their score in silence. The box feels different in your hands, now, as if you were holding a bear trap. 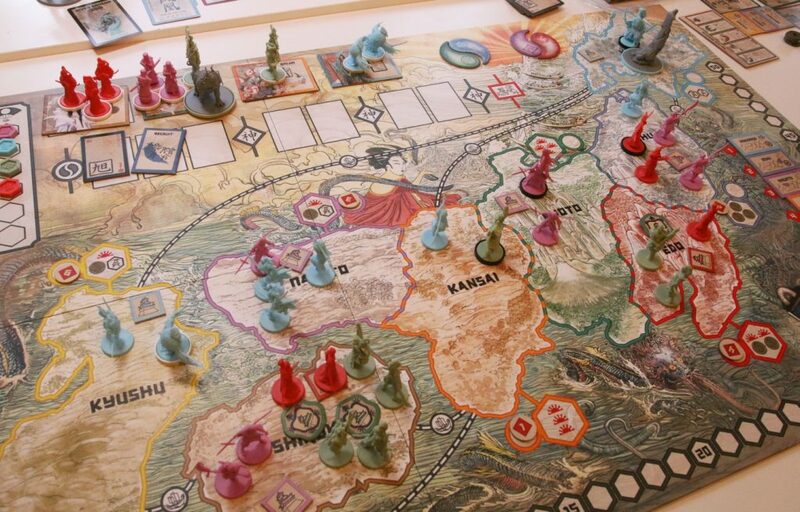 You slip it back on the shelf and turn to thank this board game reviewer. He’s… where is he? This can’t be. He’s gone. The shop owner recognises your stunned expression, and ambles over with a mug of tea.